Amy and I had our second round with French macarons last week before my mountain climbing trip (more on that later). These turned out even better than the first batch. We used the same Martha Stewart recipe as last time. This recipe has worked well for us so far and I highly recommend it. 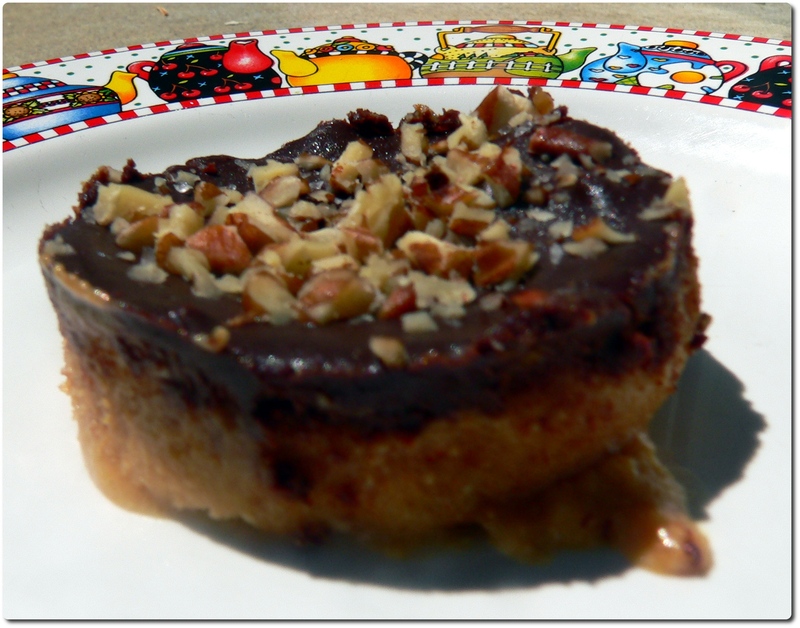 This time around we decided to use chocolate ganache as the filling instead of jam. Neither of us liked the flavor of the game with the macarons. 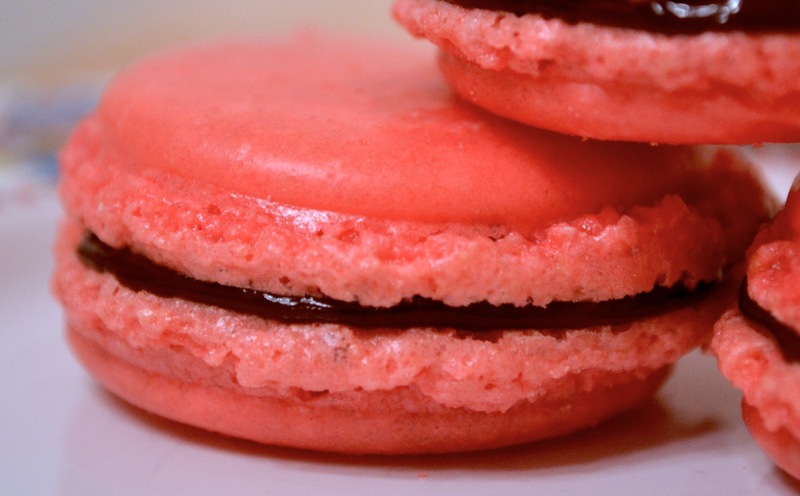 Also, we used red food coloring to make bright reddish-pink macarons as opposed to the yellow ones we made before. 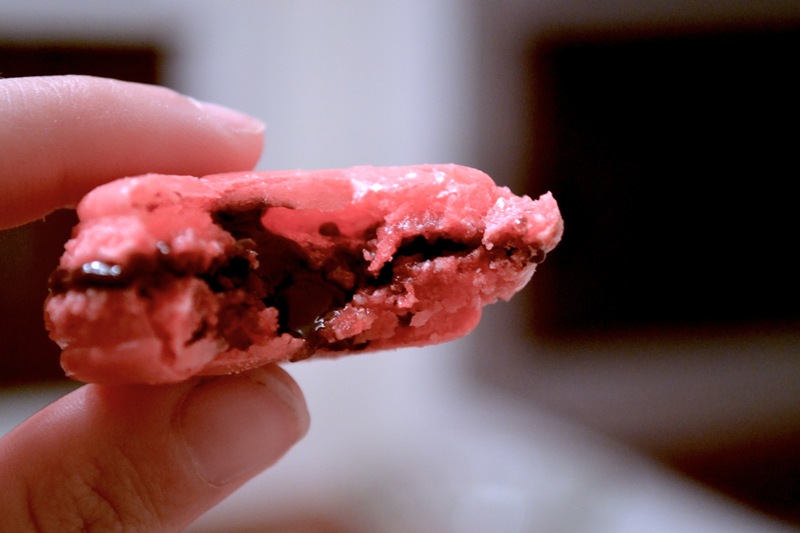 The deep pink color was nicely set off by the dark chocolate ganache. For the chocolate ganache we used Mark Bittman’s recipe from How to Cook Everything. 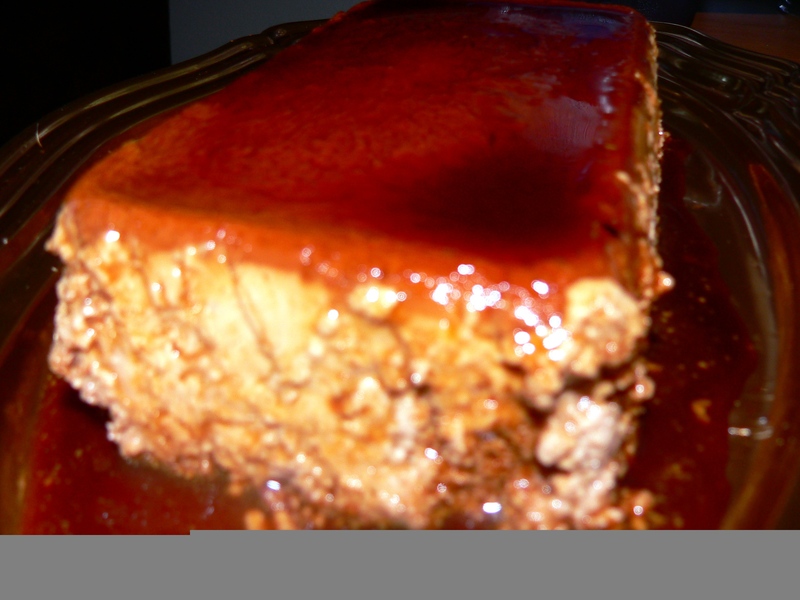 This is one of the most successful recipes I’ve had from one of his cookbooks, especially in the dessert section. 1. Pulse confectioners’ sugar and almond flour in a food processor until combined. Sift mixture 2 times. Note: We did not use a food processor for this. We simply mixed the two together with a rubber spatula in a bowl and then sifted. I prefer to dirty as few dishes/utensils as possible when tackling a large project late at night. 2.Preheat oven to 375 degrees. Whisk whites with a mixer on medium speed until foamy. Add cream of tartar, and whisk until soft peaks form. Reduce speed to low, then add superfine sugar. Increase speed to high, and whisk until stiff peaks form, about 8 minutes. Sift flour mixture over whites, and fold until mixture is smooth and shiny. 3. Transfer batter to a pastry bag fitted with a 1/2-inch plain round tip, and pipe 3/4-inch rounds 1 inch apart on parchment-lined baking sheets, dragging pastry tip to the side of rounds rather than forming peaks. Tap bottom of each sheet on work surface to release trapped air. Let stand at room temperature for 15 minutes. Reduce oven temperature to 325 degrees. Bake 1 sheet at a time, rotating halfway through, until macarons are crisp and firm, about 10 minutes. After each batch, increase oven temperature to 375 degrees, heat for 5 minutes, then reduce to 325 degrees. Note: We did not use a pastry bag. Amy forgot it at her house and we didn’t want to waste time going over to her house to get it. Instead we used a Ziploc bag with the a corner cut. This actually worked much better than the pastry bag that we had purchased at Beverly’s Fabrics and Crafts. 1. Put the cream in a pot and heat it until it’s steaming. Put the chocolate in a bowl, pour on the hot cream, and stir until the chocolate is melted and fully incorporated. 2. Refrigerate for about twenty minutes until thickened. This will make it easier to spread on the macarons. These are not Reese’s. They definitely are not Reese’s. I wouldn’t say they are better than Reese’s and I wouldn’t say they are worse. I would say they are a completely different beast. I wanted to make something for my friend Maddy’s chocolate party. I decided to make the chocolate peanut butter cups from Alicia Silverstone’s cookbook The Kind Diet. I really was looking forward to these and how tasty they were going to be and relatively not as bad for you. Well, I got around to making them on Friday and encountered trials and tribulations. First, I forgot about half the ingredients. I didn’t have earth balance or graham crackers. I figured hey I can do without these. I didn’t use maple sugar, I used refined white sugar because that is what I had on hand. 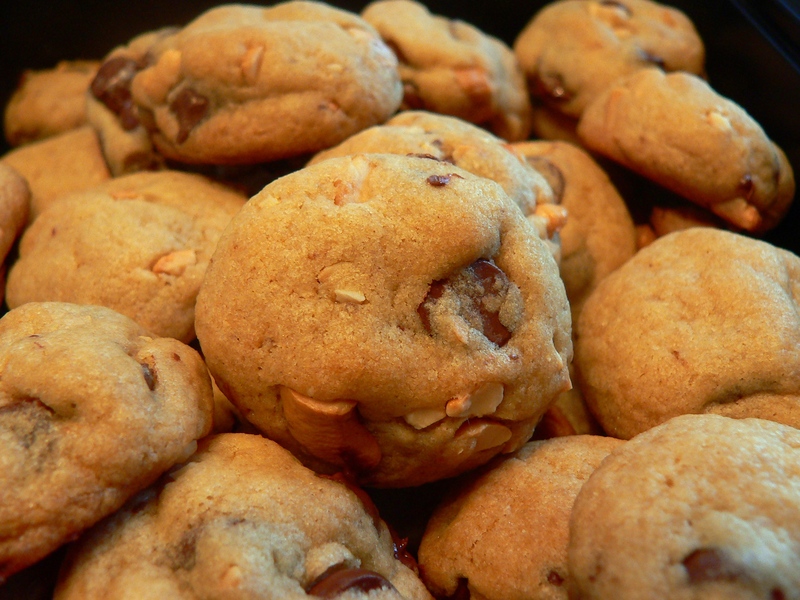 I did however use the grain sweetened chocolate chips. They taste different than regular chocolate chips, very different. They are not as bad as some carob chips that I’ve gotten and they are vegan. Then in the middle of heating my peanut butter I dropped molten hot peanut butter on my foot and burned my foot. It was incredibly painful and now I have a blister on the top of my foot. Maybe I shouldn’t cook barefoot. What I ended up with was tasty, but the peanut butter didn’t set because I didn’t add the graham crackers to it. It was overall a little too sweet for my taste and not enough contrast with sweet and salty. I added chopped nuts and salt to the top to give it a little more of that contrast. I also didn’t have paper candy wrappers or cupcake liners so they had to be scooped out of the muffin tins with a spoon. They were tasty though. My friend Maddy throws the most amazing parties. She has parties mainly to cook great food and then have people to feed it too so she doesn’t have tons of leftovers. She definitely does not skimp on the fat, sugar or flavor. She is the best cook out of all my friends and surpasses me as a cook. She is also currently writing a cookbook, which I think is amazing. The whole theme for the party was chocolate. There was so much chocolate there. I love chocolate and I went into a chocolate sugar coma after we left. I thought I wouldn’t want to eat chocolate after that but the next day I was sneaking bites of my leftover homemade peanut butter cups, which I will do another post of. 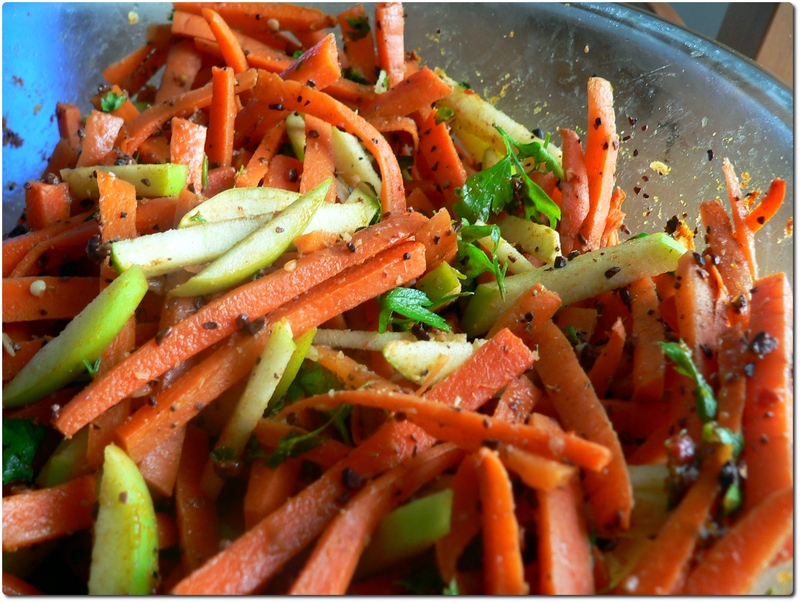 The first item is a carrot, apple, and cocoa nib Morrocan salad. It was tangy, spicy, and had just a hint of chocolate. This was probably my favorite dish of the night because it was incredibly refreshing after all the sweetness of the dessert dishes. 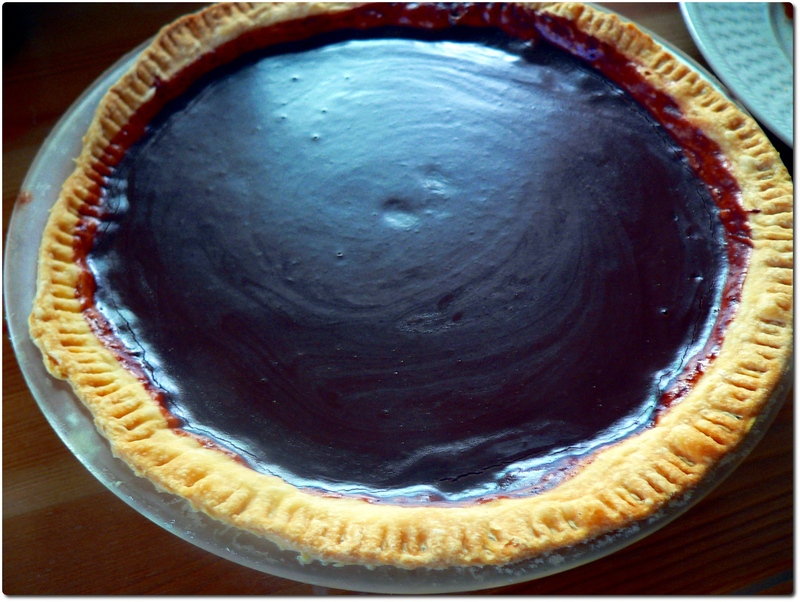 The next is my friend’s black bottom pie. I did not eat the black bottom pie because I do not like chocolate pies. She serves this with a raspberry sauce. Other people really seemed to like it. Now I apologize for the bad photo that’s coming up. Well, none of these are great photos but the next is out of focus. For some reason I just couldn’t get my hand to steady. 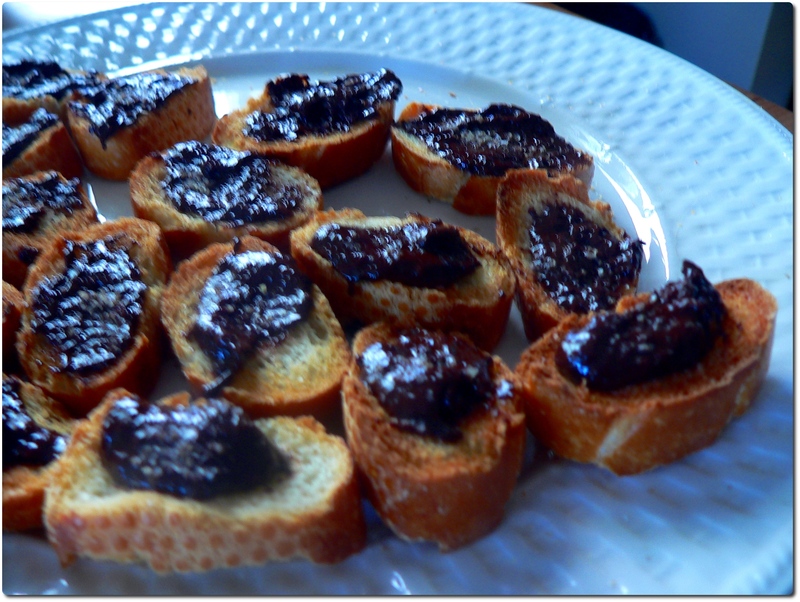 The next item is a garlic and smoked salt chocolate spread on toast. This was amazing. I couldn’t stop eating it. The quality of photography continues to go downhill since I had to rely on my flash. The next item is a chocolate flan that had a hibiscus sauce that accompanied it. I did not eat this either but the general consensus was that it was tasty. 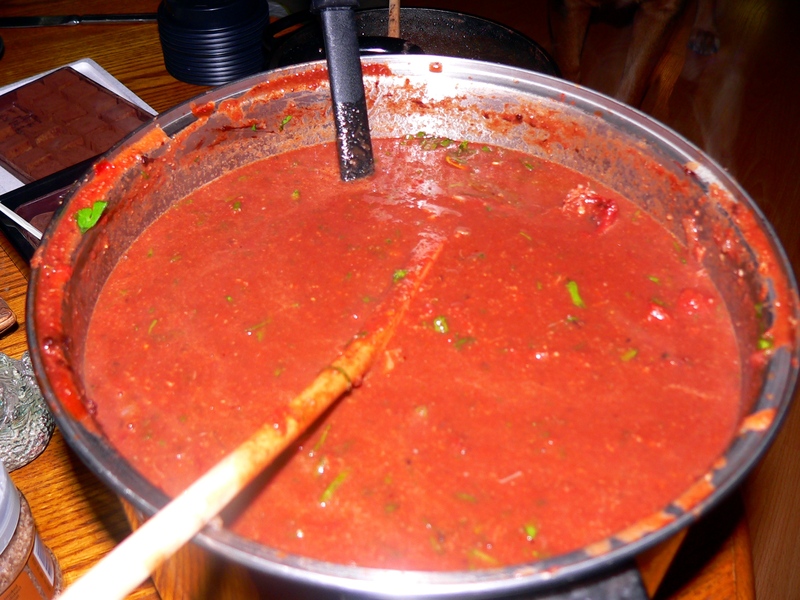 The next item is a chocolate, tomatoey, spicy shellfish stew. It had shrimp and scallops in it. I tried it and I found it a little too heavy on the tomato for my taste, but I really don’t like tomato. 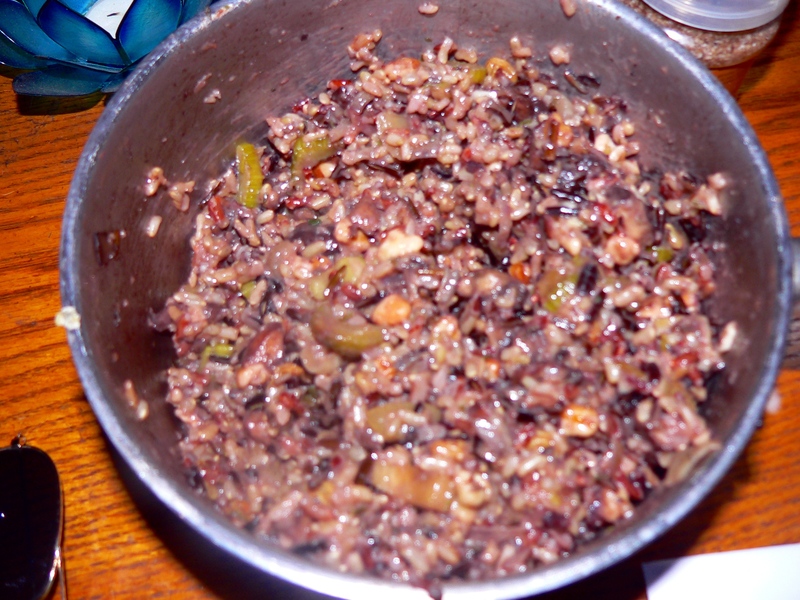 The next is a rice dish that was served with the stew. I did not eat it because it has celery in it and celery is my mortal enemy. 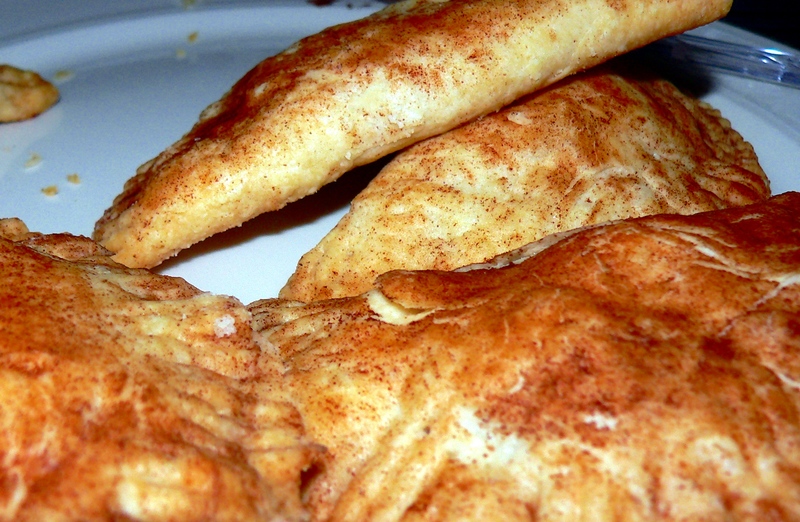 These next items are chocolate almond empanadas. They had a great taste and the texture of the crust was flaky and tender. They were a little heavy after all the other food. There were all sorts of different chocolates there including chocolate covered bacon which I had to try even though I haven’t been eating meat. I wasn’t impressed with the flavor. The bacon was a little too hickory smoked tasting for me. I would have preferred a saltier bacon to contrast with the sweetness of the milk chocolate. There were two kinds of iced tea: one a mate and another mint. They both were refreshing and had subtle chocolate flavors, but I preferred the mint. There were two kinds of hot chocolate: spicy mayan hot chocolate and vanilla hot chocolate with rum. I preferred the spicy mayan hot chocolate. In all it was a very delicious party. Now I don’t generally opt for candy like M&Ms, Snickers, or Butterfingers. I mostly don’t like the way milk chocolate tastes or the use of high fructose corn syrup in chocolate. However, I was intrigued by the newest member of the M&M line-up: pretzel M&Ms. Growing up if I had M&Ms I would go for the peanut butter ones, much better than Reeses Pieces in my opinion. I wanted to try the pretzel M&M because I like the interplay of salty, crunchy, and sweet. First it comes in a blue bag. I like the color blue. It has a picture of one of the M&M characters putting an x-ray up to his chest showing a traditional knotted pretzel inside. I knew that the pretzel inside the real M&Ms were not going to be the knotted kind, but I had to make sure this was the case. I would have been very impressed if they were able to do that. I sucked one of the giant candy spheres (these are much larger than the typical M&M and spherical in shape) until the chocolate was gone and I was left with the pretzel. Yep, pretzel ball. It is not a knotted pretzel inside. I was somewhat disappointed but not surprised. I would not go out of my way again to eat these M&Ms. They do however have the low calorie count compared to many commercial chocolate candies: 150 calories for the small bag. This doesn’t mean these are a good snack option though. I really wanted to try my hand at another vegan cookie recipe. This time I bought semi-sweet chocolate chips which are vegan. I used earth balance instead of apple butter. I didn’t use any eggs or egg replacement in the recipe, but used almond milk to wet the dough a bit. The cookies came out delicious! They didn’t spread like cookies usually do, but that’s not really a requirement for me. They were buttery, chewy, and MINI! My mother says they’re fattening, but I think most things are okay for you in moderation. 1. Pre-heat oven to 350º F. With an electric mixer, cream the earth balance and both sugars together until light and fluffy. 2. Add almond milk and vanilla extract. Mix together. Add flour, baking soda, and salt. Stir. 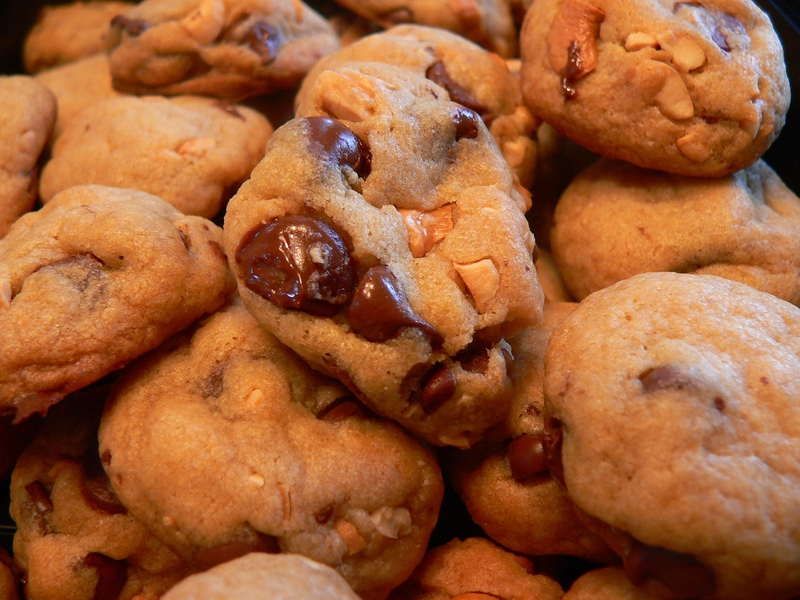 Add the chocolate chips and cashews, and mix well to combine. 3. Using a small melon baller or ice cream scoop, place dough on a non-stick cookie sheet. Don’t worry about crowding because these cookies do not spread. Bake in the oven for ten minutes or until lightly coloured. I love to bake. While baking is a lot more exact than other kinds of cooking, I still try to find room to experiment. I tried out this recipe for New Years Eve and found it to be a great success. The original recipe was taken from the Martha Stewart Living Cookbook. 1. Preheat the oven to 350 degrees F. with two racks centered. Line two baking sheets with parchment paper, set aside. In the bowl of an electric mixer fitted with a paddle, cream the butter and sugar on medium-high speed until fluffy. Add the egg; mix on high to combine. Add the zest; mix to combine. 2. In a bowl, whisk together the flour, ground ginger, baking soda, salt, crystallized ginger, and almonds. Add to the butter mixture; mix on low speed to combine. 3. Drop about two teaspoons of dough on cookie sheet, spacing each cookie about three inches apart. 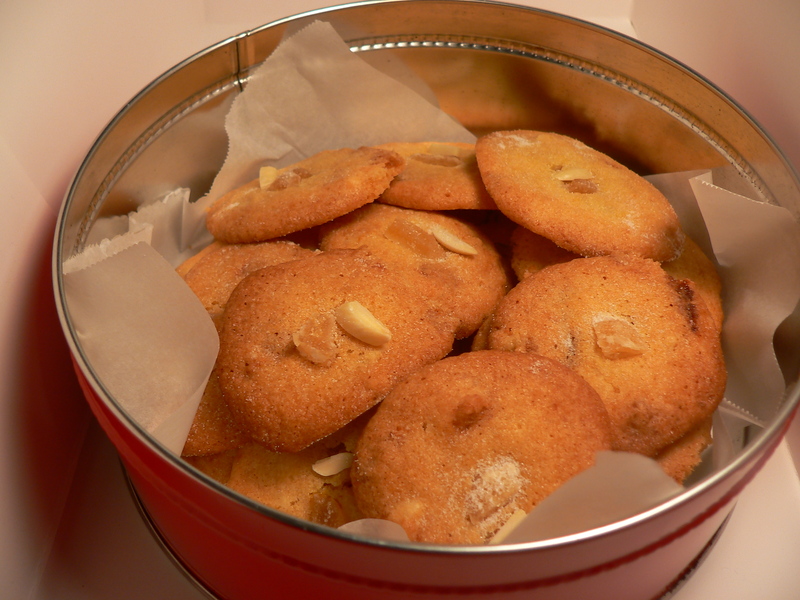 Place a piece of crystallized ginger and slivered almond on the top of each cookie. Bake for seven minutes. Remove from oven and sprinkle with sugar. Bake for another five to seven minutes.